Been away quite a while. Many changes in life. One of which is a new house (well not new as I had it before, but I used it as a rental). Hoping to update my speakers in the near future and mount the TV. I have really tried to consider all options, but as wall space is limited, it looks like the TV is going above the fireplace. Hope to take some pics this weekend of the room it is going in and get your thoughts on my idea on TV and speaker placement. Hoping to update my speakers in the near future and mount the TV. Wow- You HAVE been gone for awhile! You forgot that we quote people and take things literally! Remember if you post photos of the above, you'll be banned from this site. Looks like you have some in-wall/on-wall 22s and 150 coming. Should be nice. We had out TV above the fireplace in our previous place. As long as we were sitting in reclinable furniture it worked out fine, but even 17 feet across the room, if you weren't reclined, your neck got sore. Just keep that in mind. I am sure that you have already figured that out. 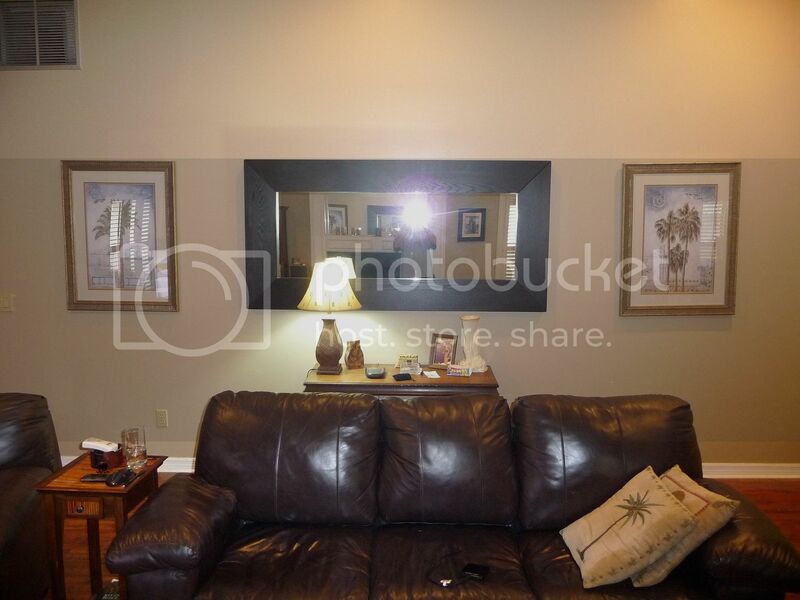 Oh, and we DO want photos of the room with the TV *attached* to the wall. No *mounting* of electronics allowed here. I am sure that you can save those for some fetish site. Somewhere Big John's ears are burning and a port hole is having flashbacks. Welcome back. Believe it or not, I was thinking about you last week. Wondered if you would ever surface here again. I saw a mount on avs awhile back that would bring the display forward and down for viewing and back up for storage. It was meant for just your situation. Thanks everyone. Let me see about getting some quick pics. The issue is the room, not many choices. Excuse the mess. This is the room. Needless to say, no where to mouth the 56" tv. 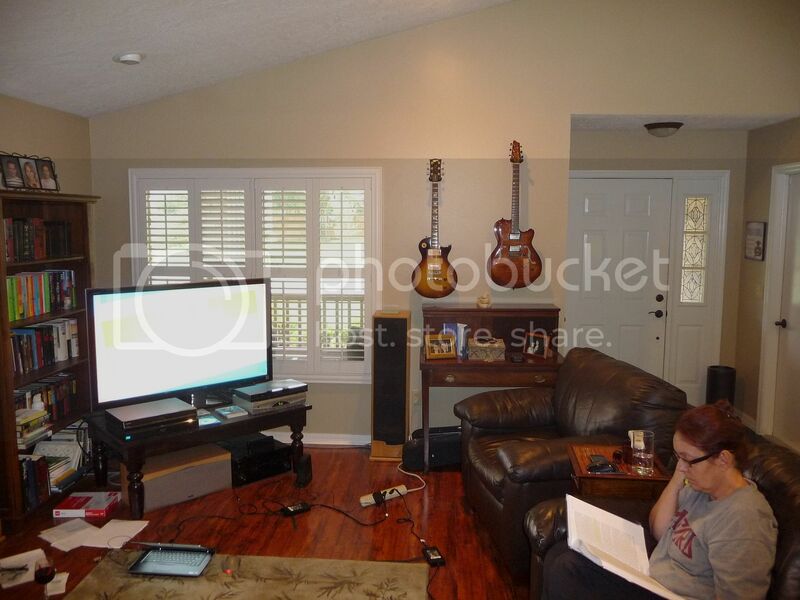 In fact, the left corner we see the tv on is my preferref location for my guitar processer and FRFR wedge. Here is the opposing wall. About 1/3 to 1/2 of that wall will be going awway when we do a remodel. As you can see, there is a pathway from the front door to the back. As seating faces the other direction, not sure about placing it on this wall. So as you see, difficult area to address. My thoughts are remove the mirror above the fireplace. Run some 2x4s around the inner peremiter as well as horizontally across the wall studs. Mount the tv to the horizontal 2x4s. I will slot the peremiter 2x4s to allow wiring to pass through, so all wiring is hidden. Pass wiring through the white "mantel" pieces. Mount the OW/IW 150 in the horizontal mantel. Mount the OW/IW M22s on the vertical mantel pieces. Will probably mount the M22s upseide down (tweeter on bottom and in line with the center channel tweeter). 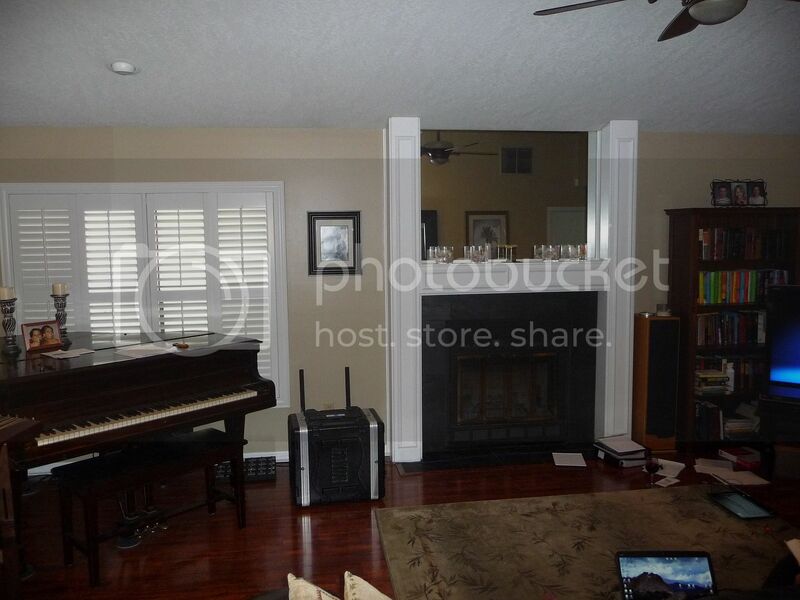 Build an AV rack that will be positioned left of the fireplace. All wiring exits through a low panel of the outer left side of the left vertical mantel piece. Will run a remote extension eye up to the TV. You only need to point the remote at the AV rack. QS8s on the back wall. Will use the current sub which is located under the piano. Distance from sofa to fireplace is 11' 6". The center of the tv will be at roughly an elevation of 71.5"
The top of the mantel is at 57"
So, any thoughts on other alternatives? I have spent time sitting in the chair sofa looking at the middle of the mirror (which is higher than where the middle of the tv would be). Doesn;t feel too bad. Oh and you can tell I am into music, with the 2 guitars on the wall (yes that is a 30+ year old Gibson LP Std), the 2 guitar cases underneath (yes more guitars), the piano and the hammered dulcimer. 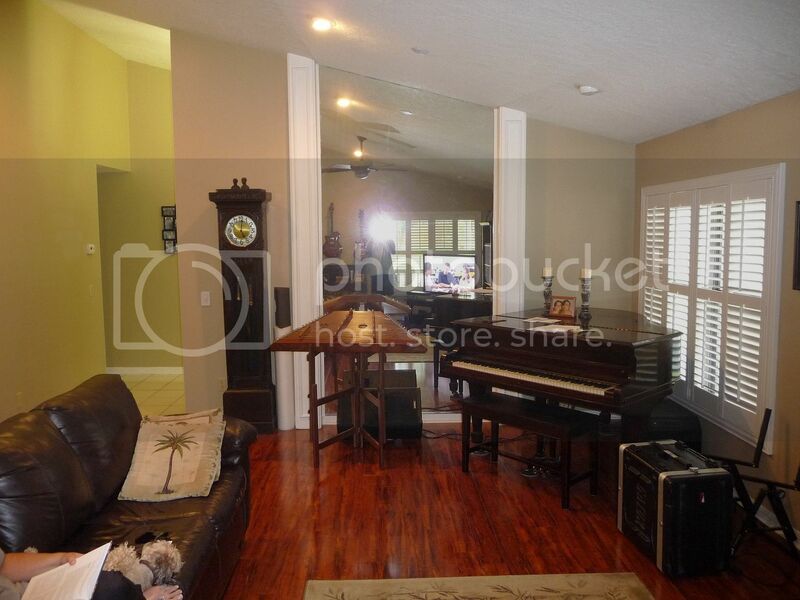 I have more instruments in other rooms as well.